I see faces in these 2 orbs. Maybe I'm just matrixing? I see a face in this one as well. The picture with the 2 orbs was taken after our dog started acting strange. Last October he started chasing something through the house that we couldn't see. 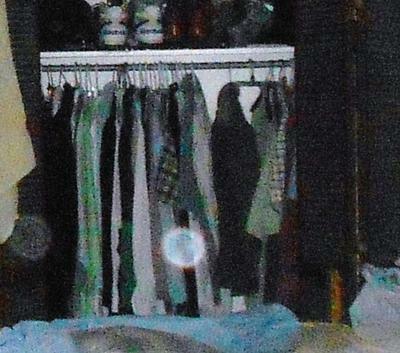 I started taking random pictures in my bedroom during the day and evenings and caught several orb pictures. He started waking me up at times in the early morning hours by jumping up and laying right by my face. He would stare across the dark bedroom at nothing, so I started taking pictures in the dark. Since October we have taken video in my room during the evening and we have 3 videos with bright orbs and other things (I don't know what they are) flying through the video. I know they aren't dust, because of the trails they leave behind due to their fast rate of speed, and they appear to respond to us. We also had some other things going on in the house at this same time, such as pictures being knocked over and unexplained sounds. Just a side note, our sweet dog is now deceased and the activity has slowed down since he has passed on. Comments for Can orbs have faces in them? Interesting! I'll have to look your story up. Thanks Dave! When you see semi transparent objects moving in a strait line they could be dust or pollen. Tiny mites floating on a thin web string are freeky. When the orb moves, then stops, changes direction and then takes off. Good chances its an actual orb. I have had some orbs in the tree branches that look like they are chasing each other. Stopping, facing off, moving left and right and their orbs flashing bright and dim. Most of the orbs are faint and have no distinguishing characteristics. I still look at them daily on the camera system but don't try to see into them unless there is a really full filled hardly transparent orb which is seldom. However I am intrigued by their existence. I've had some experiences with many different orbs. I have a story that you can read on this web site called Upgraded camera system or spirit catcher. There is a part 1 and part 2. 2 has some pictures but I have complete videos of orbs moving around. Seeing them on camera is hind site. I don't try to communicate or interact, except if there are ones that seem evil then I roust or chase them out of the house. Hi Dave. The outside orb thing is so interesting. I've caught many outside my home, but most of them appear to be dust. I've also caught a couple outside that weren't orbs at all, but like rods (red and white) of light. I see your reviewing comments. I have another bit of info. 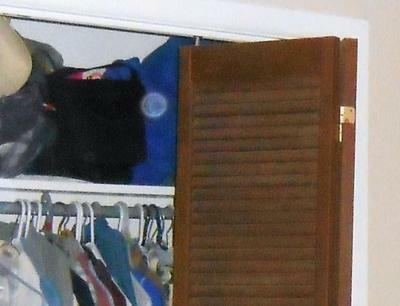 When I first discovered orbs in my old house. I believed them to be attached here. After cleansing my home 95 percent moved on. Only a few are still around. I have a group of about 40 orbs that will come through every few weeks. Have not seen them for over a month now. I can see many orbs outside my house that do not come in. I believe orbs can move to any place they want. If the place is negative to them or they no longer like it they will move on. However if conditions get favorable for them they can come back. I had to cleans my house twice. It's pretty peaceful now. They have no power to harm anyone. Just kinda spooky. Good luck and I hope they have moved on. Thank you for your comment Dave! I don't catch to many orbs these days. For some reason that particular time period we had quite a bit of paranormal activity going on in the house. Not sure what changed, but it was really interesting while it lasted. I have lots of orbs. Had to purify the house to remove evil orbs. Some orbs remained. Guess they are good. One orb became more full then most of the other orbs that are more see through, after I cleansed the house. I could clearly see my passed on dogs face. This was very clear and undisputable. Most of my orbs look like animals. I don't see faces. Depending on your camera and what pixels it uses will influence what you see or think you see. Zoom in on any solid object and you will see pixilation. Keep the shapes you see in mind while trying to figure what your orb is. Most orbs have multiple images. One of our neighbors was responsible for our dog's death. It hasn't felt dark, and after this first picture there were no other dark orbs like the one on the left. All other photo's I have are of bright orbs. Thank you for your comment and concern. Did you see faces in the orbs? I would move. No matter how difficult that might be to do. It is very possible that these "orbs" covertly had to do with your dog's death (you didn't mention how he died). Either way, I've known of other cases such as yours, and I do not believe you are safe living in such a dark environment.